We weren’t satisfied with any of the existing control panel solutions on the market, so we built our own from the ground up specifically for WordPress. The ability to manage multiple WordPress sites has never been easier! 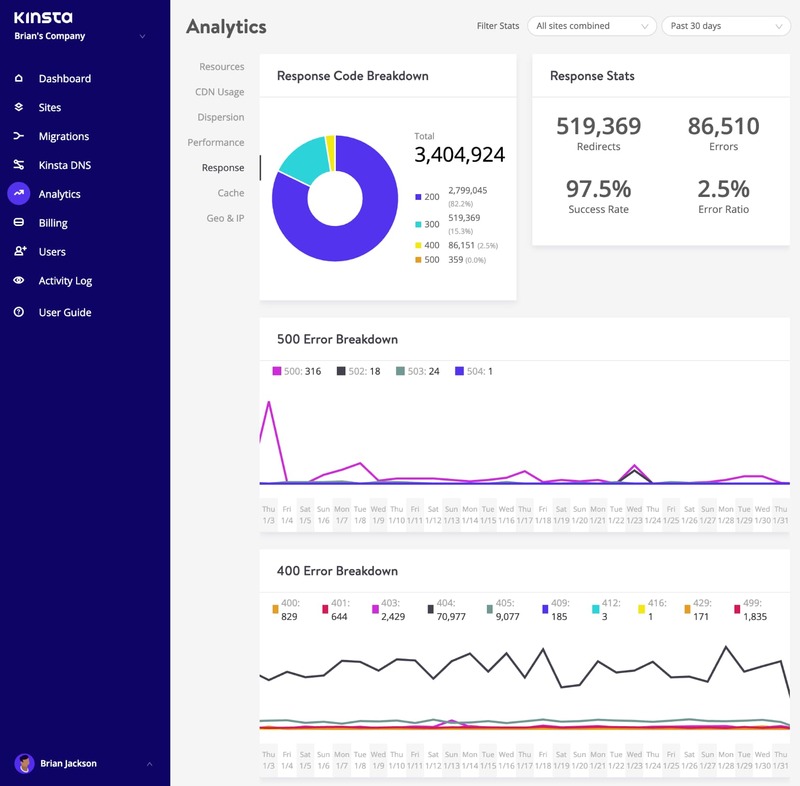 Whether you’re setting up SSL, digging into your analytics, or adding 301 redirects, MyKinsta makes this a breeze. Over the years, our dashboard has gone through multiple iterations of designs and branding as the rest of our website has evolved. 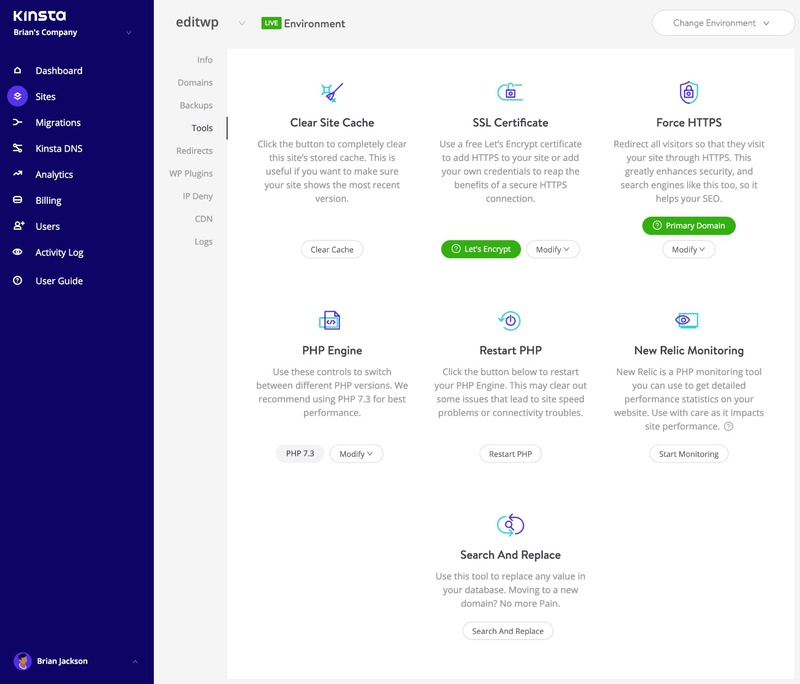 Many of the changes we make are based on user feedback and much-needed integrations with new features that we’re constantly adding to our hosting platform. The UI is now cleaner, faster, and more intuitive to use. Today we’re going to take you on a quick tour through the dashboard and show you how MyKinsta can help streamline your workflow. 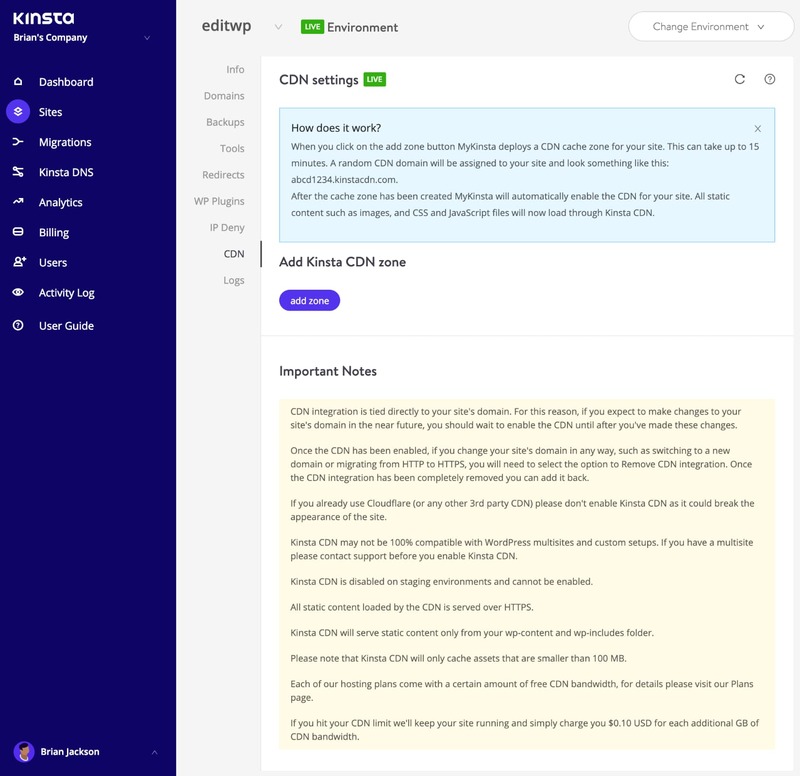 The team at Kinsta is dedicated to providing constant improvements, and over the course of the coming months, we have a lot of new and exciting integrations and features we’ll be releasing. Thank You for Your Feedback, Keep It Coming! Before we dive in, we first want to thank all of you who have provided feedback over the years. We couldn’t have done it without you. We take every single request into consideration (they are all logged and discussed amongst our team). We try to push out new features as soon as they are ready and fully tested. This saves everyone time, as many of the new features usually mean less interaction is needed with our support team. We want you to be able to do everything you need to do right from the dashboard! I just signed up for @kinsta and it's already my favorite. host. ever. Account UI is so freaking clean and simple! For those of you who might not be clients of Kinsta yet, this will give you a little look behind the scenes. 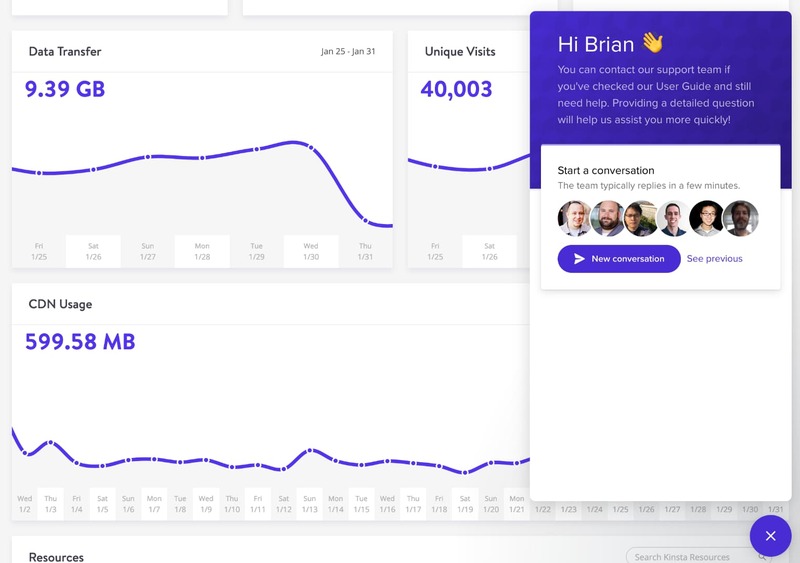 Check out some of the new features, tools, and areas in MyKinsta below. 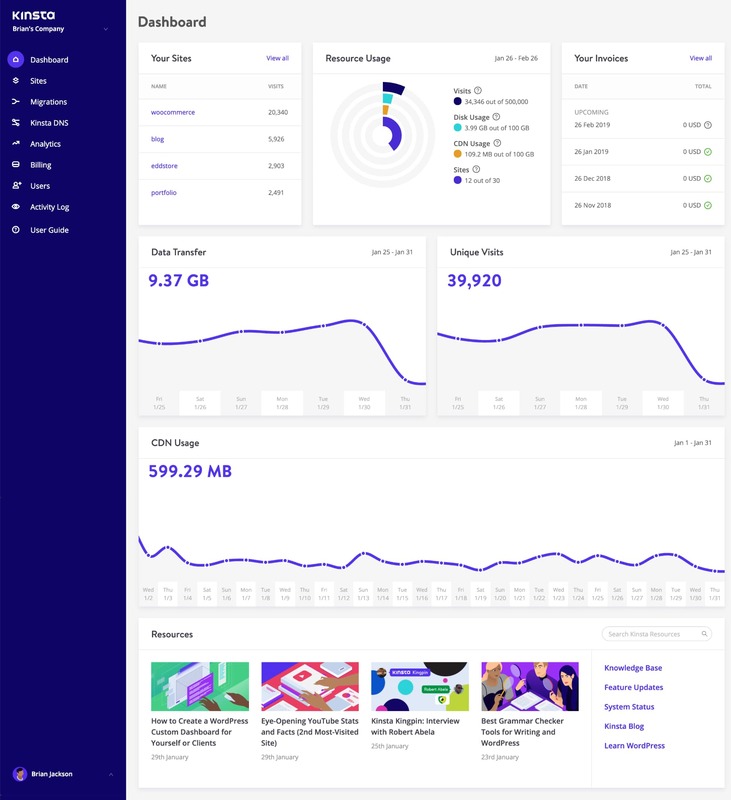 Below is the main MyKinsta dashboard, which is what you see when you first log in. 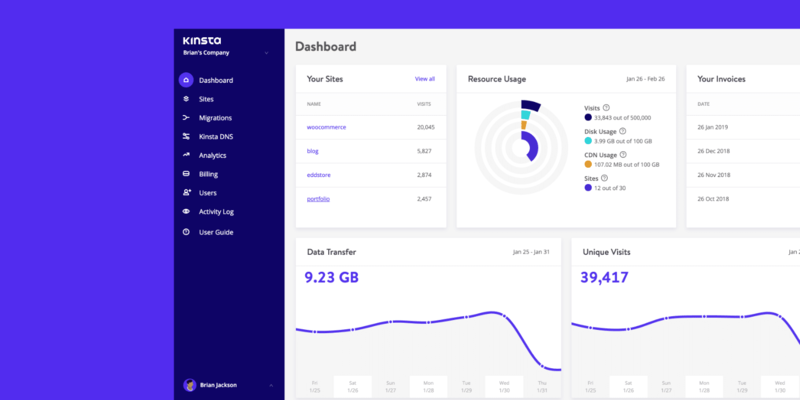 You can quickly see an overview of your WordPress sites, your total visits for the month, your billing invoices, disk and CDN usage, data transfer, unique visits, and the new content from our blog which we push out each week. Everything you need to manage your sites is quickly accessible from the left-hand side menu. English support is available 24/7/365. Spanish support is available weekdays between 10:00 and 01:00 CET. German support is available weekdays between 9:00 and 17:00 CET. French support is available weekdays between 8:00 and 16:00 CET. Dutch support is available weekdays between 8:00 and 16:00 CET. We also know that most of you are always on the go, and that is why we made sure that MyKinsta is also fully responsive, no additional app needed. This means you can easily manage your WordPress sites from anywhere. Take backups, launch migrations, check for plugin updates, chat with our support team, and even clear the cache on your WordPress site, right from your phone. 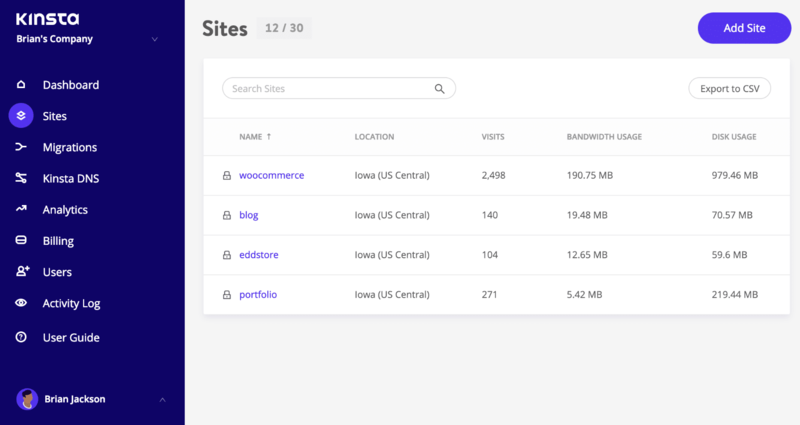 The next section in MyKinsta is “Sites,” in which you can see a full list of the WordPress sites you are managing and hosting with Kinsta. You can arrange them by name, total number of visits to your website, bandwidth usage, and disk usage. For those of you with lots of sites, there is an easy search functionality at the top. And if the search bar isn’t enough, there is a quick site navigation option a level down. This way you no longer need to go back to the main Sites page. Simply click on your “Site” at the top and you’ll get a quick dropdown with all your sites. Everything has one-click install options. You can literally launch a new WordPress site in a matter of seconds. We have all 20 Google Cloud Platform data center locations available, which allows you to place your website in a geographical location closest to your visitors. This decreases network latency, lowers your TTFB, and ensures blazing fast load times for your visitors and or customers. You can also optionally check the option to install WooCommerce and the Yoast SEO plugin. Need to run a multisite setup? No problem, our installer lets you preconfigure multisite for subdirectory and subdomain installs, without all the domain mapping complexity. When you click into manage one of your WordPress sites you are first met with the site “Info” tab. 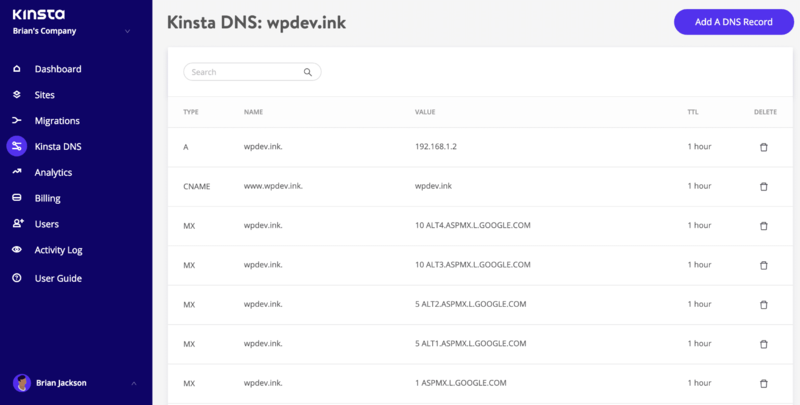 This allows you to see your data center location, IPv4 address, SFTP/SSH and database connection information, and also a link to manage your database directly in phpMyAdmin (Open MySQL). We have status indicators of “Live” and “Staging” to remind you which site you are currently managing. There are also confirmations which require manual input for all important tasks such as deletions, migrations, etc. There is a handy “Copy to clipboard” option which makes copying your credentials to third-party tools (SFTP and SSH clients) faster. Need a new SFTP password? Just click the button and you’re good to go. No more asking for database password changes. 😉 Under the Database Access section, you will find a “Generate New Database Password” option. When you use this your wp-config.php file is automatically updated (as long as it’s located in the site root, which is default). You can easily change between your live environment and staging environment from the drop-down menu. Staging environments give you a playground to test new plugins and themes, the latest PHP versions, code modifications, and other changes. When you create a staging site it will be a copy of your live site. Once you’re ready you can send all changes back to your live site with the push of a button. 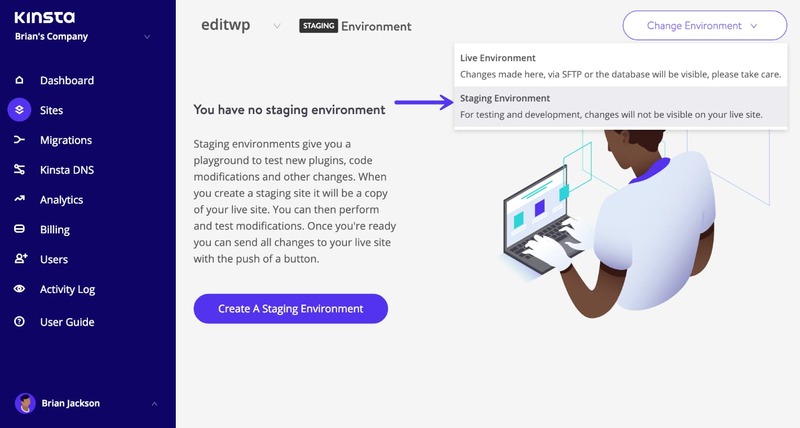 To create a staging site, click on “Change Environment” from the drop-down menu at the top right and choose “Staging Environment.” If a staging environment doesn’t already exist, then click on the “Create a Staging Environment” button. 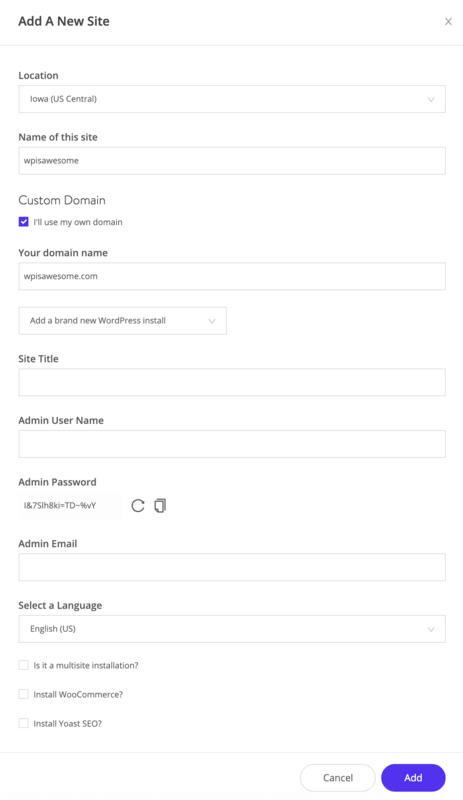 The next section of your WordPress site is the “Domains” tab. In here you can add your primary and additional domains. You can set your primary domain, which is the way we refer to your site. The DNS records for the primary domain must be set up correctly for it to work. 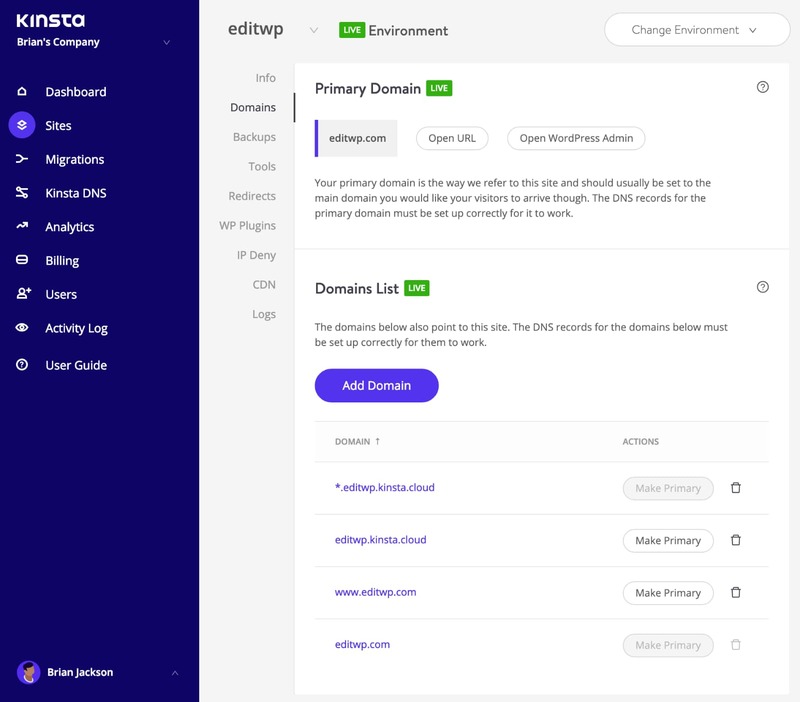 If you don’t choose to add your own domain on a fresh install, you will see your temporary Kinsta URLs (yoursite.kinsta.cloud). There is also a link to open your WordPress admin. We also now have tooltips available throughout each section of the dashboard that link to our helpful in-depth knowledgebase articles. We spend a lot of time (hundreds of hours) writing content in order to help save you time. 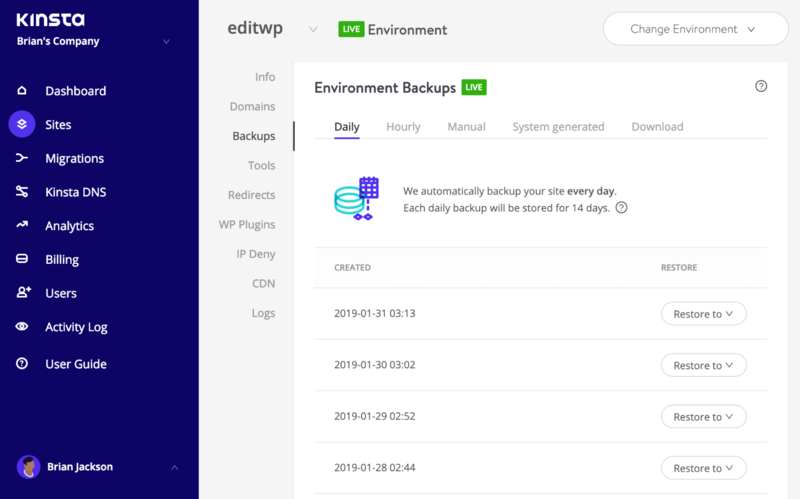 Daily: We create a backup automatically every day. Hourly: For many of you, daily backups weren’t enough and we heard your feedback. For those of you dealing with highly dynamic sites (ecommerce, LMS, membership), we now have an hourly backups add-on. Manual: You can create up to 5 manual backups. These are recommended when you’re rolling out a change on your live site which perhaps couldn’t be tested on staging. System generated: We create an automatic system backup at certain events (for example, when you restore a backup a system backup is automatically generated). Download: You can never have too many backups. Want to manually download a secondary backup and store it offsite? No problem, you can create a downloadable backup once per week (per site). Our system will generate you a .zip file containing your files and MySQL database. Daily, hourly, manual, and system generated backups are stored for a 14, 20, or 30 days depending on the plan you’re on. 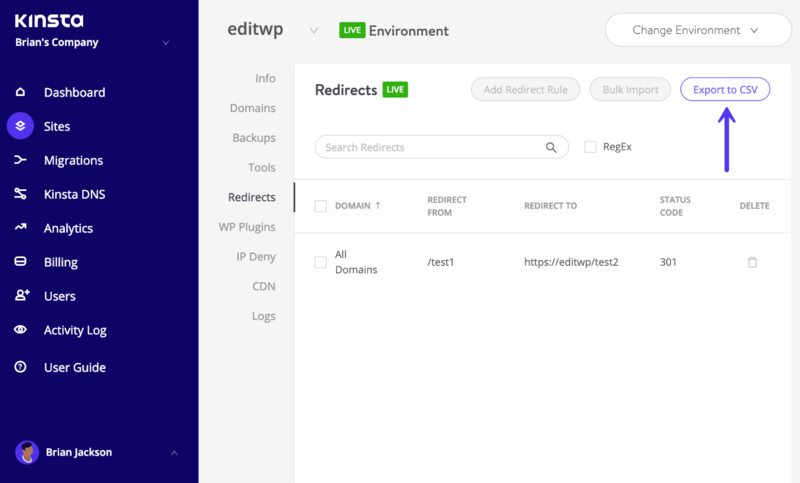 You can easily restore your site from a backup with a single click, or you can even restore it to staging. Clear your WordPress site’s cache. This is useful if you want to make sure your site shows the most recent version. 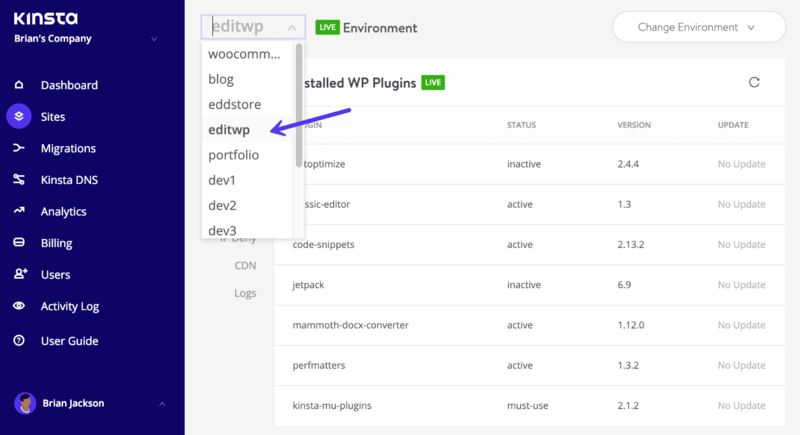 Remember, the Kinsta MU plugin is also installed by default on all new sites. Enable a free SSL certificate with Let’s Encrypt or add a custom SSL certificate. Force all of your traffic to redirect over HTTPS. Change between supported PHP Engines (PHP 5.6, 7, 7.1, 7.2, and 7.3). Restart PHP. 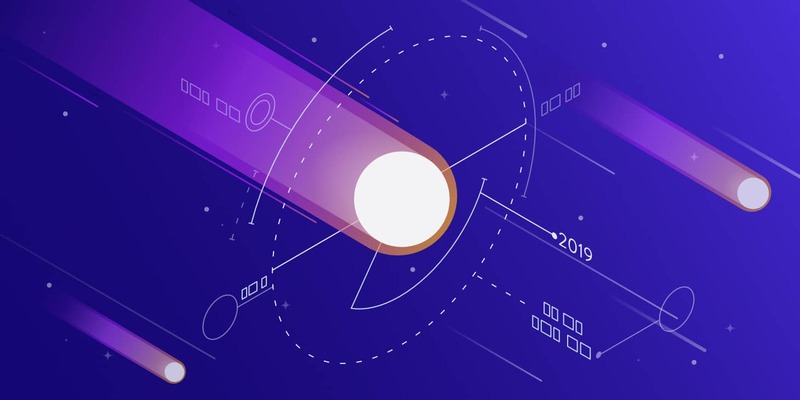 This may clear out some issues that lead to site speed problems or connectivity troubles. Enable New Relic monitoring with your own custom license key. Perform a bulk search and replace on your site. You can use both bulk import rules as well as export redirects at any time to a CSV file. The next section of your WordPress site is the “Plugins” tab. In here you can see a list of all your installed WordPress plugins, both activated and inactive. View the current version number as well as if there is an update available. Dealing with a bot, spammer, or hacker constantly hitting your site? Depending on the severity it could have a big impact on your visits and bandwidth, in which case you might want to try blocking them. Previously you had to reach out to our support team to block IPs, but you now have the ability to do this yourself with our IP Deny tool. Since v2 of the dashboard, we’ve now partnered up with KeyCDN, an HTTP/2 and IPv6-enabled content delivery network with 35 locations, to turbocharge your assets and media around the globe. 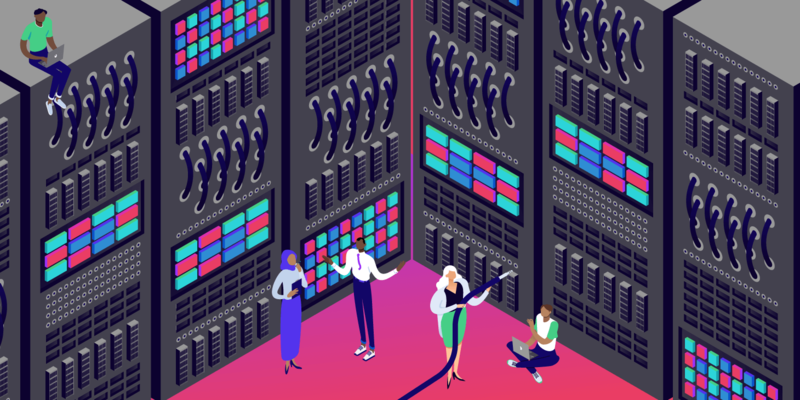 In our experience, a CDN typically can help offload 70% of bandwidth requests from your web host and in some cases reduce load times by up to 50%! 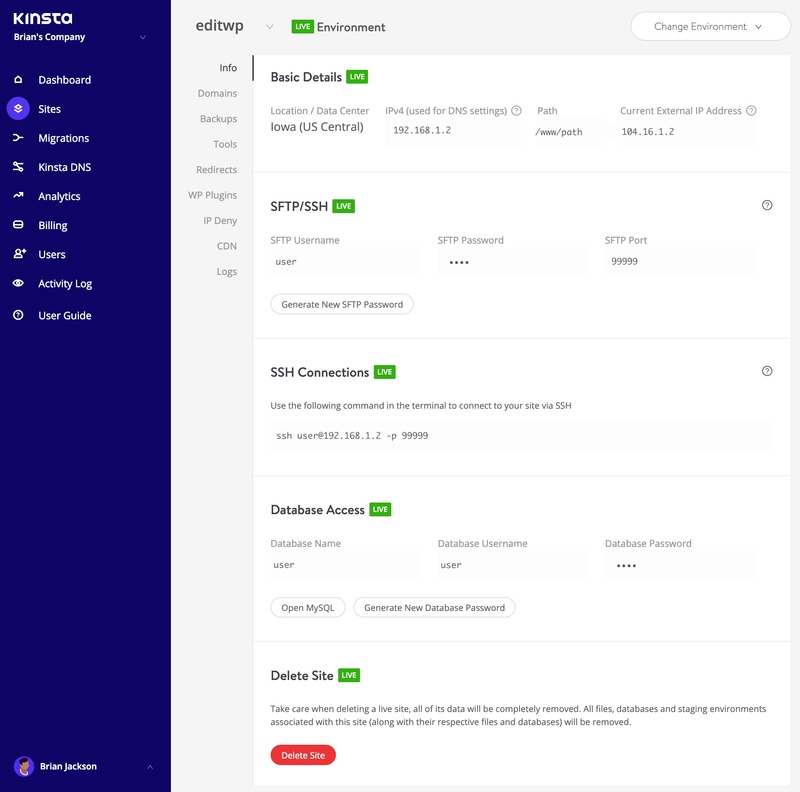 You can enable the Kinsta CDN with a single-click from the MyKinsta dashboard. The next section of your WordPress site is the “Logs” tab. 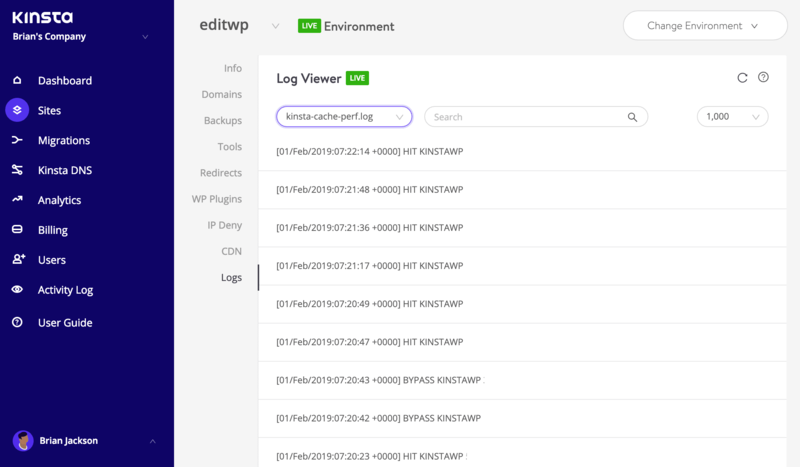 Being able to view log files from the dashboard is a fast way to quickly debug something without having to spin up your SFTP client or command line. You can view your error.log, kinsta-cache-perf.log, and access.log files. By default, it will show the last 1,000 lines. You can drag the slider across to see the last 20,000 lines. There is also a search and force reload functionality. The next section is WordPress migrations. You don’t actually need to open up a ticket with our support team to migrate a site. 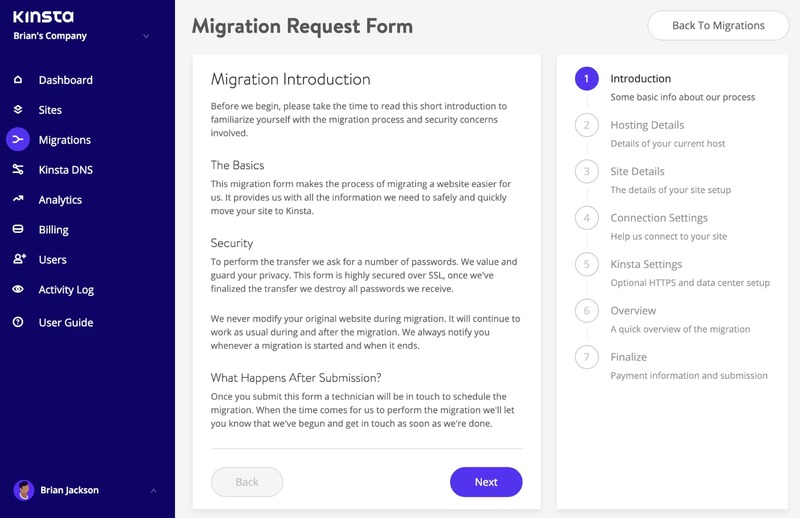 Simply launch “Migrations” from the left-hand side and click on “Request Migration.” Every plan includes a certain number of free migrations. We can, of course, migrate extra sites over for you for an additional charge. We even have bulk migration pricing. 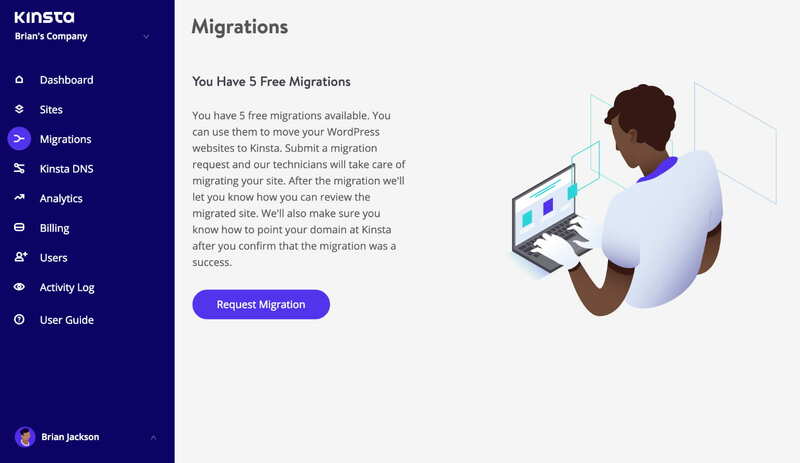 For a limited time we are offering unlimited free WordPress migrations from WP Engine, Flywheel, Pantheon, Cloudways, and DreamHost. See the details. After the form is submitted we then get in touch with you to schedule the migration for a time that is most convenient for you. 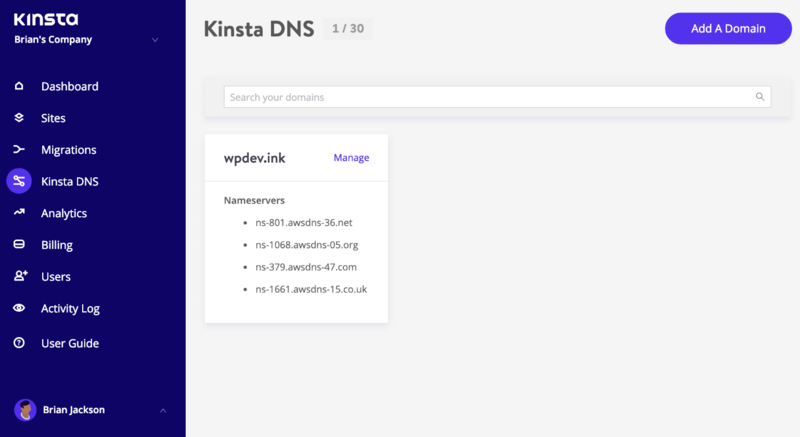 If you’re taking advantage of our premium DNS services with Amazon Route 53, the “Kinsta DNS” section is where you can manage all of your DNS records. It also supports in-line editing for quick changes. We support the following records: A, AAAA, CNAME, MX, TXT (SPF can be entered as TXT), and SRV. You can also change the TTL time. Resource Usage: Visits, bandwidth usage, top requests by bytes, top requests by count. CDN Usage: View bandwidth usage, top files by requests, top files by bytes, top file extensions, and HTTP response codes. Dispersion: Mobile vs desktop traffic. Performance: Average PHP + MySQL response time, PHP worker limit, PHP throughput, AJAX usage, top average PHP + MySQL response time, top maximum upstream time. Response: Response code breakdown, response stats, 500 and 400 error breakdown, redirect breakdown, 404 error breakdown. Cache: Cache component stack, cache component chart, top cache bypasses. Geo & IP: Top countries, top regions, top cities, top client IPs. 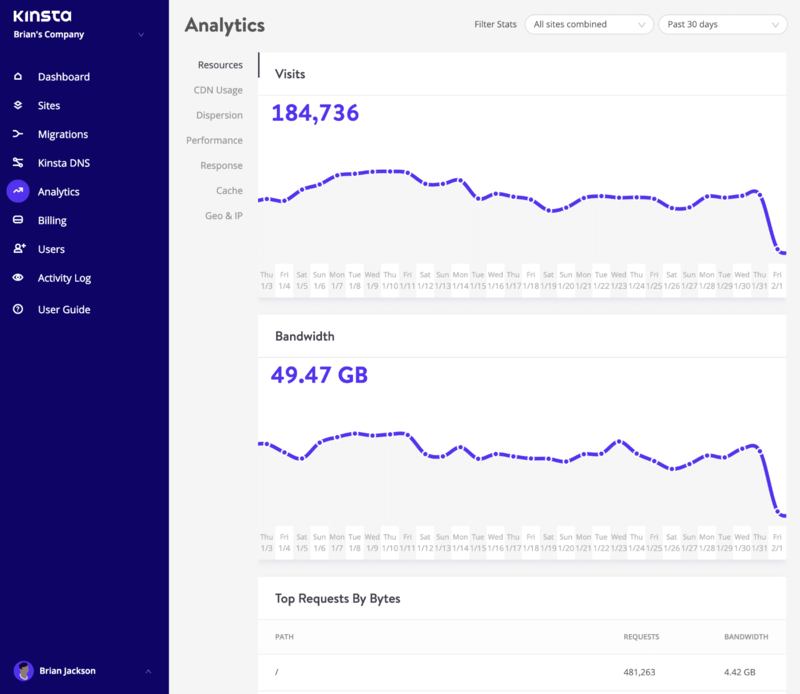 Here is just a preview below of some of the many stats you can view, such as unique visits, data transfer, top requests, etc. There are filters which allow you to see a combined total or you can view each site individually. You can also toggle it between the last 24 hours, last 7 days, and the last 30 days. If you highlight a specific point in time on the graph it will show you some comparison statistics, such as the total number of visitors being higher than the previous day, etc. 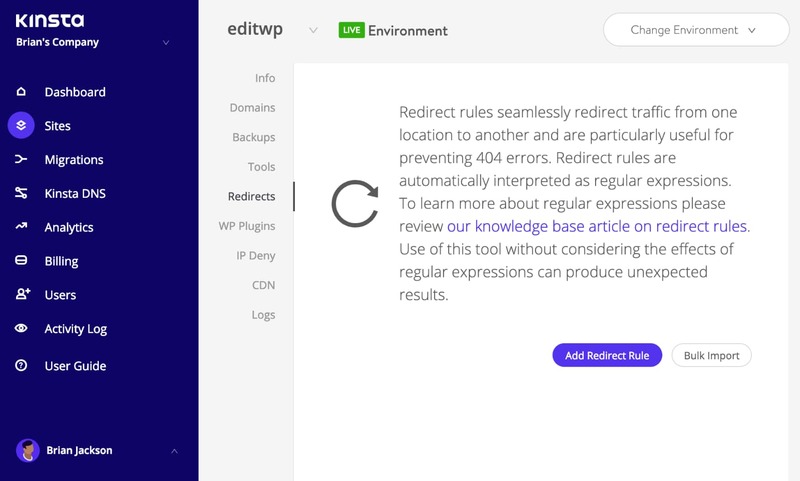 Under the response analysis section, you can see a response code breakdown, response stats, errors, error rate, etc. Or under the cache analysis section, you can see how many requests are serving directly from cache, bypassing cache, missing, expired, etc. Want to see more? 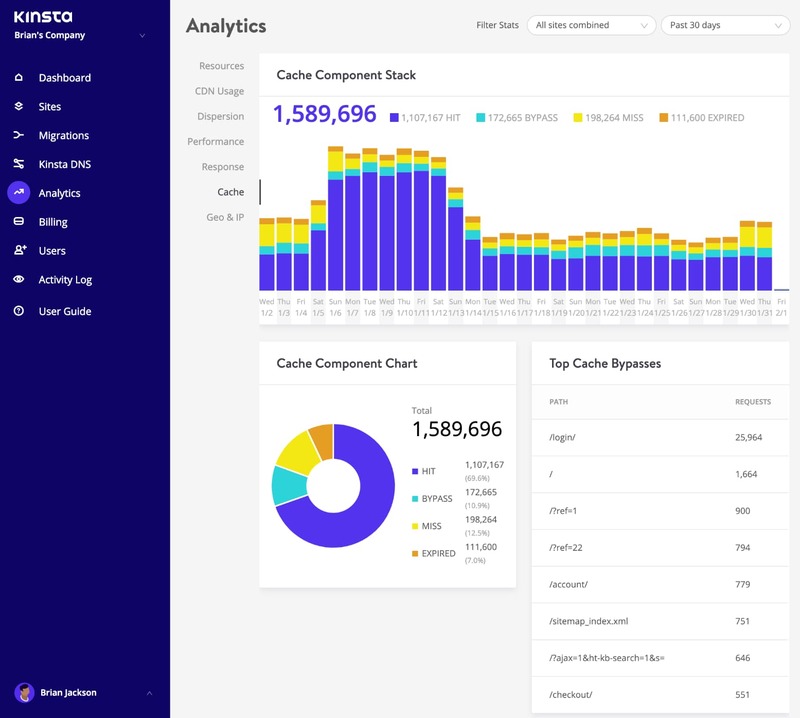 Check out our in-depth walkthrough of MyKinsta Analytics. Don’t forget our activity log. 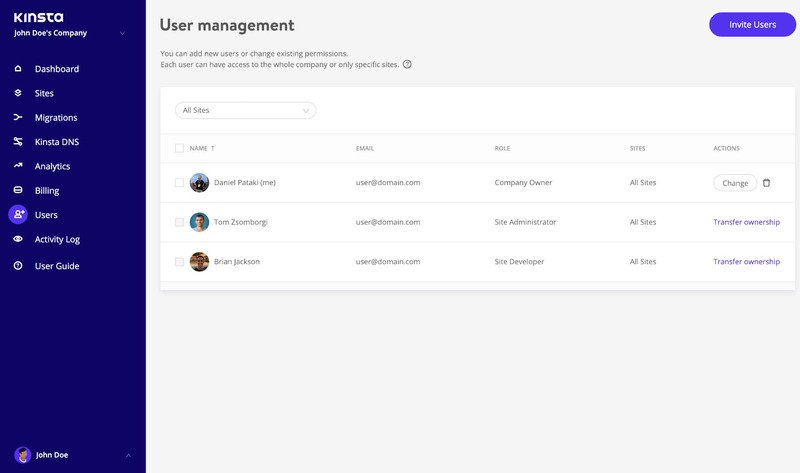 In here you can view all actions that are taken within your account within the last 8 weeks: such as site creations, deletions, domain changes, etc. If you have multiple users on your account, this logs it globally so you can see who did what action. We would normally skip over the settings section as it typically doesn’t contain anything interesting. But there are a couple features you in here you don’t want to miss! Our global initiative team has translated all of the screens to provide you easier access and management of your WordPress sites in your native language. Simply click into “Settings” and there is now an option to change your language. We heard you developers! 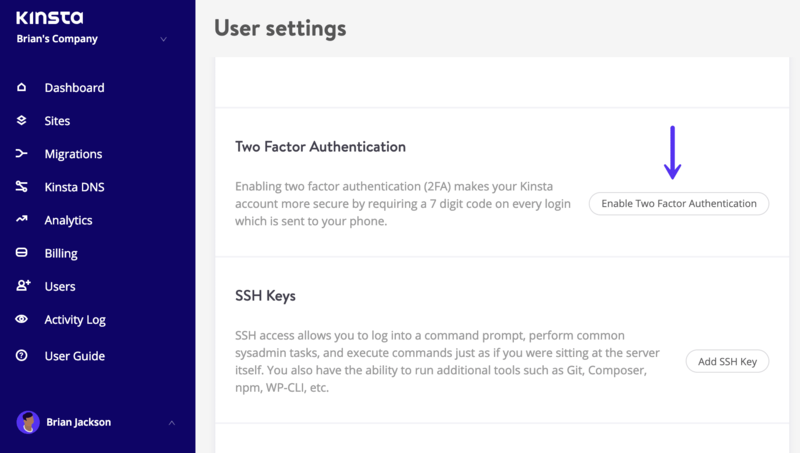 Kinsta now provides SSH access on all of our hosting plans. 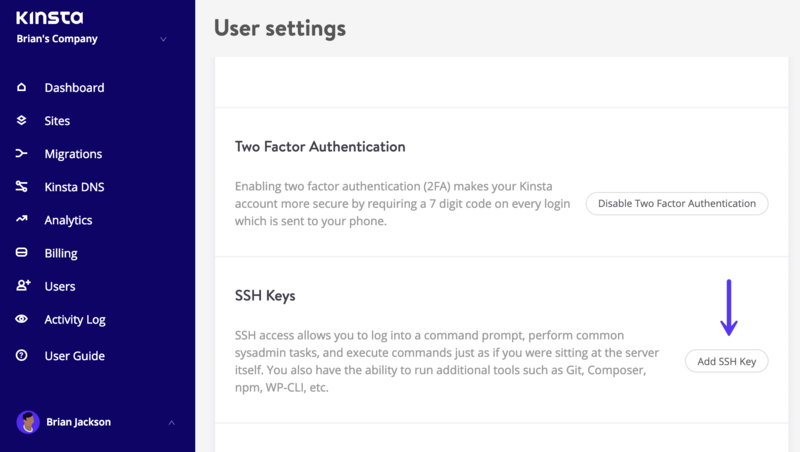 You can add your SSH keys in the MyKinsta dashboard. This provides a more secure way of logging into a server and eliminates the need for a password. Although you can further protect your login by adding a passphrase. To add your public SSH key, click into “User Settings” and you will see a section at the bottom of your user profile to add SSH keys, along with a label. Last but definitely not least, you can enable two-factor authentication. 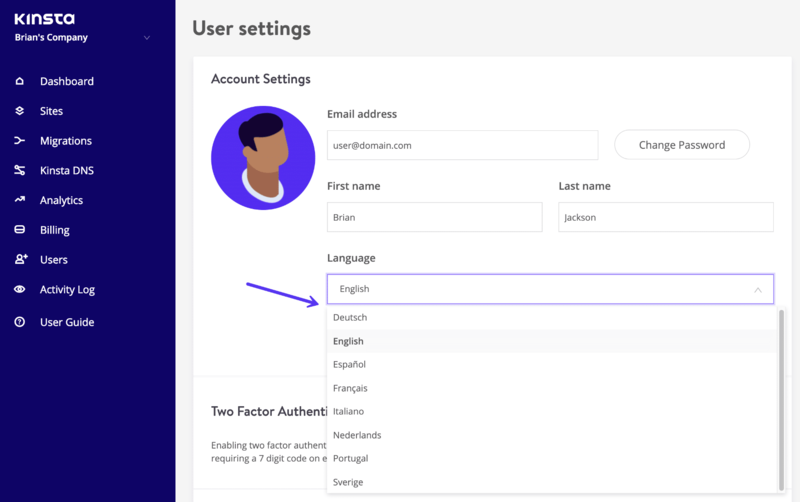 This makes your Kinsta account more secure by requiring a 7 digit code on every login. We highly recommend everyone utilize this feature. We focus a lot of our time and effort into our architecture and performance. And while that is very important, we realize that streamlining the management of your WordPress sites is also a priority. Coming from another hosting service that used cPanel or Plesk? (Check out this comparison) Don’t worry, MyKinsta has all the features you’re familiar with and more. The only difference is that MyKinsta was developed specifically with WordPress in mind to save you time and clicks. 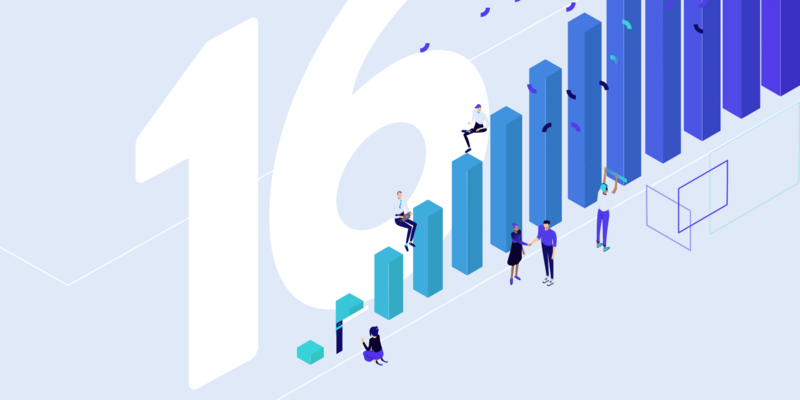 If you’re tired of other clunky dashboard tools, we’re positive our MyKinsta dashboard will blow you away! Make sure to stay tuned to our feature updates page. All current clients are also notified of new features via our internal messaging system. And of course, you can subscribe to our blog to keep informed of everything that is changing here at Kinsta. Whether you’re an existing client or someone just checking us out, we would love to hear your feedback on our MyKinsta dashboard! Let us know below in the comments. Thanks Alex. 😄 We are constantly working on improvements to our MyKinsta dashboard. If you have any feedback, just let us know! Great! But I swore it was something like MainWP or ManageWP. What about? Hey Marcus! In a lot of ways, it is, and we are adding more and more features every month. However, it will always be a tool just for Kinsta clients.